UPDATE 12/10/2012: We have good news! Please see our update – Draw Down the Troops!! Projects To Be Funded!! 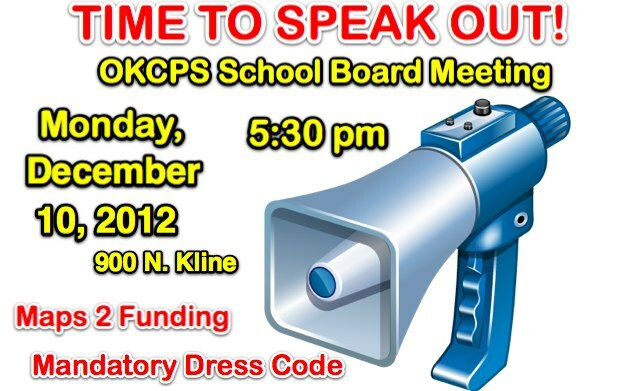 The time has come to “CALL OUT THE TROOPS” of the ClassenSAS PTSA to attend the OKCPS School Board meeting on Monday, December 10th, 2012 at 5:30pm at the OKCPS Administrative Building: 900 N. Kline. 1. A Dress Code proposal making school uniforms mandatory in every OKCPS school, including Classen. 2. A vote on the board for the MAPS Phase II proposal for Classen SAS. The proposal was pulled from the November 19th meeting vote by chairperson Angela Monson. This is the first time that has ever happened, We are in serious jeopardy of losing the MAPS Phase II budget. As detailed in the attachments linked below, this proposal is about BASIC SAFETY AND HEALTH CODE ISSUES which must be addressed at ClassenSAS. PTSA is asking both parents AND students from ClassenSAS to attend the December 10th meeting and share comments about these issues during the “public comment” portion of the board meeting. We need to make appropriate, passionate and reasonable pleas on both of these issues, but especially on the Maps Phase II funding change proposal. Public Comments at an OKCPS Board meeting are limited to 3 minutes per person. Speakers must apply in person at the OKCPS administrative building from 5:00 pm-5:30 pm. Only speakers that follow this procedure are allowed to speak at the meeting. While we want parents to attend and speak, we ESPECIALLY want to encourage ClassenSAS students to also speak. Please see the attached letters (in PDF format) from ClassenSAS PTSA President Dixie Hendrix and ClassenSAS PTSA MAPS Liason Pam Newby. Both these letters provide additional background and specific details about the MAPS Phase II proposal. The letter from Dixie also includes photographs of numerous items which require repair at Classen. It’s vital we speak out and make our voices heard on these issues at the upcoming December 10th board meeting. Please plan to attend and speak out! November 28, 2012 in Announcement, Featured.